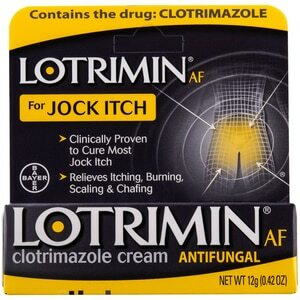 Get relief from the jock itch symptoms of itching, burning, cracking, and scaling skin with Lotrimin AF Jock Itch Antifungal Cream. The active ingredient in this jock itch treatment is clotrimazole, which helps to relieve the discomfort of jock itch symptoms and is clinically proven to cure most jock itch infections. Relieve itchy, cracked skin on your inner thighs and groin with this odorless, greaseless, and non-staining formula that s easy to apply topically to affected skin. Fight fungus with the power of Lotrimin AF Jock Itch Antifungal Cream your tinea cruris is no match for this antifungal cream that works to control jock itch. Safe for kids over age 2. PROVIDES RELIEF: Effectively relieve itchy skin on the groin and inner thighs with Lotrimin Ultra Jock Itch Cream. PROVEN TO CURE MOST JOCK ITCH: Treat tinea cruris, commonly known asjock itch, with the proven power of this clotrimazole cream. SAFE FOR KIDS OVER 2: Help your little athlete with burning, chafing skin on his or her inner thighs and crotch. DOES NOT STAIN CLOTHES: Lotrimin delivers a worry-free antifungal cream treatment in an odorless, greaseless, non-staining ointment that's easy to apply. IDEAL FOR MEN AND WOMEN: Many people assume that only men get jock itch, but women are also prone to fungal infections on their crotch skin. Inactive ingredients: benzyl alcohol, cetyl alcohol, cetyl esters wax, octyldodecanol, polysorbate 60, sorbitan monostearate, stearyl alcohol, water. Benzyl Alcohol, Cetyl Alcohol, Cetyl Esters Wax, Octyldodecanol, Polysorbate 60, Sorbitan Monostearate, Stearyl Alcohol, Water. Stop use and ask a doctor if. there is no improvement within 2 weeks.